The law in North Carolina requires the operator of any motorcycle to have a motorcycle endorsement shown on their driver license. An endorsement may be obtained upon initial issuance of driver license, or at any time thereafter, by taking a knowledge test that includes questions on motorcycling, and an off-street motorcycle skills test. This basically means that you need to habe a non-commerce NC automobile license first to get your motorcycle endorsement added to your license. The registration fee for a private motorcycle is $18.00, or an additional $30.00 for a personalized plate. Some counties may require a Regional Transportation Authority Registration Tax of an additional $5.00. DMVCheatSheets.com offers a variety of options to help you easily prepare for and pass the North Carolina Motorcycle Written Test. 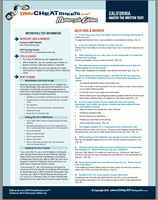 The North Carolina DMV Cheat Sheet is a downloadable, immediately accessible 3-4 page reference guide featuring the top 50 questions and answers to help you easily pass your North Carolina motorcycle written test. Also includes DMV fee, what to bring, what to expect and more! North Carolina DMV Motorcycle Cheat Sheet & Online Practice Test Bundle is the most complete and easiest way to prepare for your DMV motorcycle written test. You get our downloadable, printable 3-4 page cheat sheet to take with you to review as well as our online practice test system, featuring 100 multiple choice questions and answers similar to those you will come up against when taking the North Carolina DMV motorcycle exam. Our study material cover every chapter of the NC DMV motorcycle manual including rules of the road, traffic signals, laws, signs and safety.